Two years in the making and clocking in at nearly three and a half hours, 'Jodhaa Akbar' is quite an impressive piece of movie making. Unfortunately though, every film of this type will invariably be compared to the legendary 'Mughal-E-Azam' and will therefore never be considered on it's own merits. I liked this movie and would recommend to anyone interested in watching it to enjoy it's opulence on the big screen. Ashwariya looked ethereal (when does she not?) and her outfits & jewelry alone probably outweighed her by a fair amount. 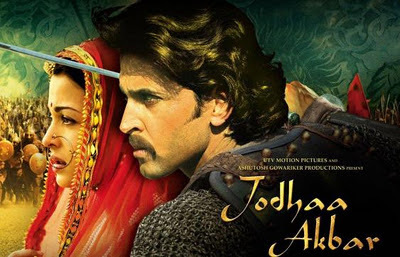 Hrithik is not an actor that I have ever been too impressed with but he did a fair job in his role as the Mughal emperor who tried to unite India by marrying a Hindu queen. I could not help imagining what Abhishek Bachchan would have done in the title role but again, comparisons of what this movie should be like need to be left at the entrance of theater. For some more thoughts about this movie please visit the websites of our friends Beth & Carla. The songs in the movie are composed by the Shehenshah of modern day Bollywood, Allah Rakha Rahman. The whole comparison of 'Jodhaa Akbar' to 'Mughal-E-Azam' comes full circle when you remember that A.R. Rahman's birth name was Dileep Kumar. He converted to Islam after an imam offered prayers to heal his ailing sister when he was younger. In fact the selection for today Kwhaja Mera Khwaja is not only composed by A.R. Rahman but sung by him as well. I didn know that about AR RAhman- good bit of trivia that! I loved this movie. My favorite song is the sufi one sung on the wedding night. Beautiful! I wonder if it will translate well to the small(er) screen though. My favorite songs are Ajeem O Shaan and Mann Mohana . But in the movie there are both cut, so I like the album versions better. both the songs were in the movie when I saw it. I love all the songs but the movie didn't live up to my expectations though. Sanket--Great review of the movie! I'm so glad you, Beth and Carla loved this film because it gives me something to look forward to! Another advantage I have is I have never seen Mughal-e-Azam and therefore will not be comparing the two. This will also be my first Bollywood "epic-style" film. Can't wait and thanks for another great review, Sanket! Nafisa - I enjoyed the movie on it's own merits, the only criticism I have is that it could have been a little shorter (but then again that is the case with most Bollywood movies). Nida - Would love to hear your thoughts on this movie on your maiden voyage of Bollywood epics ;) I am sure you will love it but you have inspired my next blog entry - the movie that I keep coming back to when thinking about this one --- 'Mughal E Azam'. 'White rainbow'...it stars Sonali Kulkarni...do check it out if you get a chance. Shweta - now a miniseries ala 'Mahabarata' is an idea I could definitely get behind ;) When we watch Bollywood movies at home we sometimes do treat them as miniseries and watch them over 2-3 nights (due to time constraints). BEV - thanks for stopping by and I enjoyed your review of the movie as well. Interesting point about Ash's acting being praised more when she is wearing brown contact lenses! Trupti- will look around for 'White Rainbow', thanks for the suggestion. You've mentioned before that you're not a fan of Hrithik, so I wondered if that would affect your enjoyment of the film - glad to hear you still liked it. I just saw it yesterday and really enjoyed it. I love 'Khwaja Mere Khwaja' - so beautiful. I agree - it was a beautiful song. About Hrithik, I honestly can't say I have seen a single movie with him in it that has blown me away with his acting abilities. Like Carla said in her review, it would have been nice to see him get his hands a little dirty and not be so darn princely all the time! That being said he was adequate in the role - handled the diction of the Urdu dialogue well and basically didn't do anything to distract me from the grandness of the movie as a whole. As part of a cultural tour of Rajasthan last month, our tour guide took us (12 Israeli women) to experience a Bollywood Epic. We thought we would probably leave after the first hour....At intermission she asked who wanted to stay and it was a unanimous decision to complete the whole movie. Quite an accomplishment, seeing that it was in Hindi and didn't even have English subtitles. We all loved it and have purchased the CD and are waiting for it to come out in DVD. Wow - some feat but then again the movie is quite a visual feast. Two of my other favorite Bollywood epics include 'Veer Zaara' & 'Mughal-E-Azam'. And check out two of my favorite Bollywood movies of the last few years in 'Dor' & 'Water' - reviewed 3 of those on my blog - just enter the name in the search box. AR Rahman's original name is Dilip. Both his parents are hindu. He and his mom converted to Islam sometime in early 1990s may be 1993. He even married a muslim lady and is a practising muslim. Apparently he had a rough childhoold ie spent days hungry - a madrasa or mosque used to feed him and his mom. Why do you think this hunk of a guy doesn't get his fingers fixed. He is so gorgeous. I'm still waiting for the DVD price to come down, meanwhile it's only going up. Maybe when I come to India in the winter I can find it cheaper. Anonymous - Thanks for the info, if I remember correctly he converted to Islam because of a promise he made to an imam when his sister was very ill. I think it's also very interesting that he went from Dilip to a Muslim name while one of our greatest actors went from Yusuf to Dilip (Kumar). Shira - Thanks for stopping by! The commonly accepted reason for ol six fingers is that in Hinduism it is considered auspicious and would therefore be a sin to cut the extra digit off. When our friends sit around and watch music videos we play a game in which we see how well the director hides the finger. When we do spot it we pause the DVD and everyone groans/laughs in mock horror :) I think the movie is available on Netflix now if you don't want to splurge on buying it. Also, if you enjoyed this movie then you will also appreciate some other big budget Muslim themed epics: Veer Zaara, Pakeezah, Mughal E Azam, Umrao Jaan (either version).